The E&O Hotel has hung on to the majesty of its colonial past. Sitting outside on its manicured lawn sipping a gin and tonic it’s not hard to imagine colonials in their crisp white suits doing exactly that just 100 years ago. The evening light filtering through the coconut grove and the warm evening breeze makes for a perfect evening. If you live on Penang island in Malaysia, this is just one of your options for an evening out. Penang lies in the Straits of Malacca just offshore from mainland Malaysia. George Town, Penang’s capital, is Malaysia’s number one tourist destination, and it’s filled with restaurants, bars, and some of the best street food in Southeast Asia. 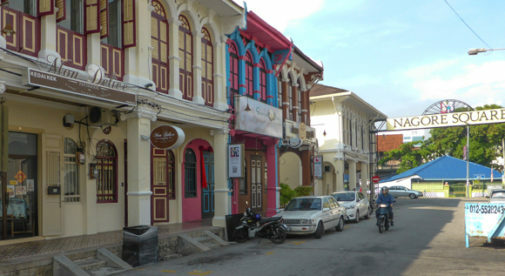 A UNESCO listed historic city dating from 1786, the buildings on the island are unique (they have disappeared from Singapore and mainland China), and the historic streets of George Town are the main attraction to visitors. Great beaches and beautiful islands are just a ferry ride away. My wife Lisa and I have been living here for over five years now. When friends and family ask why we moved here I remind them that the low cost of living in Malaysia is one-third to one-fifth of what it costs to live in the States. 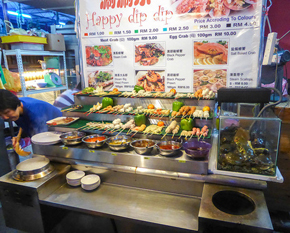 Penang is renowned for it’s vibrant street food culture. Food “hawkers” line the streets selling Malaysia delicacies, as well as Indian and Thai fusion dishes, for under $5. For $650 per month we live in a spacious 2,000-square-foot apartment with three bedrooms and three bathrooms. It has a covered carport, swimming pool, and well-equipped gym. We also have a maid that comes in once a week for four hours at a cost of $40 a month. All of the bedrooms and the lounge have air-conditioning and they are also fitted with ceiling fans. Electricity costs us roughly $70 a month and water costs 62 cents a month. Our local market in Palau Tikus is just a five-minute walk away and sells vegetables, fruits, bread, meat, and seafood. An entire bagful of fresh fruit, which includes mangoes, bananas, devil fruit, a pineapple and a bunch of bananas comes to just $5.50. Two people can eat out comfortably for $3.50 per person—add an additional 57 cents for a beer. Cable internet costs just $21 a month for unlimited downloads and TV with every channel imaginable costs $28 a month. We own a four-door Renault hatch, and the insurance and road tax costs us just $126 per year. Imported vehicles are expensive due to the high import tax, but retirees can buy imported vehicles on a one off deal for 60% less in their first year on the proviso that you hang onto it for five years. We also wanted a place where we could base ourselves and travel throughout Asia on a whim. Since moving here we have often traveled to Bali, Cambodia, Thailand, the Philippines, and Laos. Flights are cheap and the amazing temples of Angkor Wat are only two-and-a-half hours away. We’re continually amazed on a week-by-week basis of how much we do and how busy our friends are. We didn’t experience a culture shock and Penang, having being colonized by the British, has all the infrastructure that the British are famous for. Also the main language is English, which make it an easy island to live on and friends are easy to make, both local and expat.